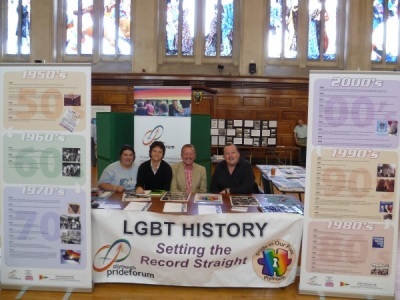 Saturday 23rd July 2011 saw Pride in Our Past volunteers behind a stand in the Guildhall, as part of the Plymouth and West Devon Record Office’s special event, Archives from the Attic. People were encouraged to attend the day and share their stories as well as bringing documents and memorabilia for inclusion at the records office. 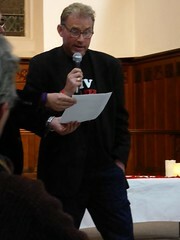 The volunteers were specifically looking to speak to members of the LGBT community and add to the picture, that’s gradually building, of Plymouth’s gay past. 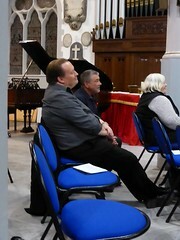 We were delighted by the number of people who came to talk to us, many prompted by Chris Robinson’s article in the Herald newspaper the week before, and we were told some fantastic stories which we intend to follow up on for inclusion in the archive. We were told stories of some Plymouth drinking venues, which had hidden histories that may not have been commonly known (until now) and also learnt some new phrases specifically relating to the city and its once underground but lively gay scene. The day was a great success and left the volunteers feeling even more sure that there is a wealth of material just waiting to be uncovered.